We run this guesthouse since 2007 for travel lovers. Our building is 90 some years old former traditional Japanese Ryokan. Located close to center, Kiyomizu temple, Gion area in 10 min. walk. All private rooms with shared shower rooms and bath rooms. Our staff also love traveling and meeting new people. We have traveled other countries and in Japan as well. We hope we can meet you and have good conversation. Of course we try to help you and give you some tips in Kyoto:-) Looking forward to see you here in beautiful city Kyoto. ・Our house has 2 floors and 1 basement. ・Clean bed sheets. Air Conditioning. Non-Smoking. ・Shared Shower rooms and Toilets are on the basement. ・Towels are available for an extra charge. ・A free-use kitchen is available to cook own meals. ・Bicycle rental is available for an extra charge. ・Provide city, bus, local map. ・The room get enough sun light. 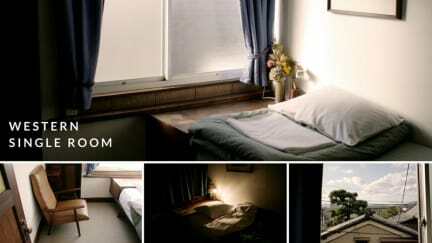 ・The common room is an simple Japanese style tatami area, offering a place to chat with other　travelers or just relax. ・We also have a roof deck on the top floor with nice views of the surrounding area including Kyoto Tower and the local Gion neighborhood. Higashiyama area of Kyoto where we are located is one of the most preserved historical areas in town and suitable place to experience traditional Kyoto. Especially the famous Kiyomizu Temple and Yasaka Shrine and Gion area are located in 10 minutes walk from our place. 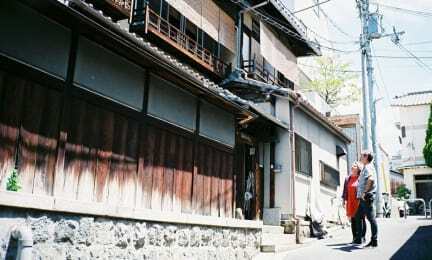 There is a narrow alley, wooden building, and feel the atmosphere of the original capital. Walking Higashiyama area, you can spend more than half a day, such as neighboring temples, shrines and shops, cafes and restaurants. Downtown is 15 minutes away. Beyond Gion and Yasaka Shrine, it is also good to visit Heian Shrine and Nanzenji then walk along the road to Ginkakuji. My favorite hostel I have stayed at. The staff was so nice, friendly and helpful. Great location, nice kitchen available for use. Not the most social hostel but if you hang out in the common dining area you might be able to chat with other guests. Would highly recommend!! Amazing to experience a traditional Japanese room with its own little moss garden. Walls are thin and so we were woken up a couple of times by other guests talking in the eve or morning in other rooms, BUT that is only because it is so beautifully quiet in the area. Would recommend and stay again! I am no longer sure of anything. If I satiate my desires, I sin but I deliver myself from them; if I refuse to satisfy them, they infect the whole soul. The hostel was a peaceful retreat from the weight of existence. I had a really nice stay at gojo guesthouse, the staff was super nice, the location great and the place was very clean. I would stay there again. Loved this hostel, it's soooo beautiful. Traditional architecture and the staff couldn't be better ! Absolutely amazing place for the price! It has a very traditional feel to it, all the while being close to Gion and other places. The staff are A+ as well, so friendly and helpful and nice. This place was perfect for two day trip to Kyoto. The hosts were super accommodating. I accidentally scheduled my stay for the wrong day and they were more than willing to let me make last second changes without charging extra. Would definitely stay here again. Nice old style guesthouse in great location. I stayed in the single western style room which is cosy and comfortable. Slept really well here as it's quiet and it has blackout curtains (sun rising around 4.30am). Kitchen has all you need, also good showers. Bathrooms down a couple flights of stairs but the house isn't very big so not a big deal. Super friendly and very helpful staff. Would gladly stay here again. Overall I had a lovely time at this guesthouse. I stayed in a single room and it was super cute and clean. Reception staff were extremely helpful. Location is ok, not really in the centre of things but easy enough to get to the main sites. Unfortunately it was extremely quiet when I stayed and didn't socialise with other guests.